Orange County Center for Contemporary Art’s (OCCCA) exhibition “Art As Protest” is less about art than it is about politics. Little of the work is incisive enough to bring us to a new understanding of our place in any organized movement, with even fewer of the pieces innovative enough that they offer us an opportunity to look at that art in a new way. Without that spur to action—as something groundbreaking or provocative—the art here only reminds the viewer ad nauseam of the many social issues that need work, without offering any real ideas on how to solve them. At its core, the show is an invitation to despair. Reflective as that might be of current politics, with people laying their head on a pillow at night, paranoid and fearful of the next day’s Trumpism, it’s still a disservice to art’s potential, in that little of it appeals to the more hopeful spirit within us. There are some moments of optimism, most notably Robin Repp’s black-and-white infrared photos taken during the Santa Ana women’s march in January (used in the last issue of this infernal rag to pimp my short summer art preview). The photo is taken from the inside of the crowd, in the middle of the action, facing forward and tilted up, as if the women within the frame are marching into a kind of heavenly battle. It’s glorious, even if you don’t buy my semi-religious reading, and my favorite piece in the show—perfectly inspirational as a propaganda piece, without intending to be so. Mila Reynaud’s No Name #3, a metallic print of a Chicano activist wearing sunglasses, a bandanna and gloves, continues in that vein, showing us strength through his anonymity; he’s part of a group, an Everyman reformer. Cheers also to Elon Schoenholz’s series of nine portraits, “Protest Grid.” Some carry signs, some wear slogan T-shirts, a few are grinning, some full-on pose, a handful look as if they can’t be bothered to slow down as they pass. As with Repp’s photo, they’re out there doing it, not mired in self-pity. I’m going to skip commenting on most of the No. 45 art, even as ably executed as some of it is, because they’re unenlightening. Why bother spending the time painting someone whose ugly mug is splashed across all media 24 hours a day, without having something to say about the individual, aside from the obvious? 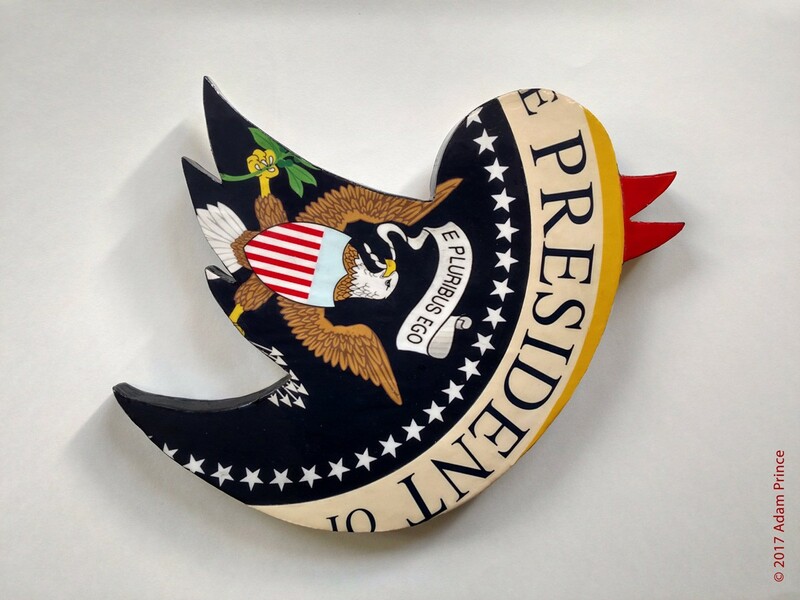 Instead, I bow to Adam Prince’s laugh-out-loud funny #Hailtothetweet or E Pluribus Ego, a photographic, paper-on-wood presidential seal in the shape of a Twitter logo. I laughed at Joseph Donnison’s Leprechaun Deportation, with ICE agents holding guns on a trio of Irish fairies cradling one another on a floor, and enjoyed Dwora Fried’s shadowbox Alternative Box: Sheep Persisted, appreciating the pun and liking, if not fully understanding, the diorama of vintage dolls in what resembles a tiny bathroom. Two other fine pieces of work are dark enough to give pause. The stark black-and-white graphics of Justyne Fischer’s horrific woodcut on stretched voile, 16 Shots 30 Seconds, details the 2014 police murder of Laquan McDonald, a black teenager in Chicago. Bullets fly through the air like drones, punching perfect white holes in the boy’s flesh; lethal spiked beams of light shoot from the police car, as well as the streetlamps, resembling inverted Statue of Liberty crowns. Scott Froschauer’s Old Glory, a flag scorched into canvas via lit gunpowder, brings to mind the continuing gun violence that devastates our country, resonating with both the numerous black casualties of state violence and the recent assassination attempt against Congressman Steve Scalise and other Republicans as they played baseball. As with the neophyte protester taking her first tentative step into the rabble-rousing crowd, awareness is important, but after awareness comes action. Action should not, however, be confused with painting a picture. If the show at OCCCA sounds interesting enough to get you off the couch, away from the talking heads of MSNBC and spur you into action, great! But it’s preaching to the choir, a non-confrontational confirmation of what most of us already believe and think, reminding us of things we already know and not challenging us in the slightest. I can’t blame jurist Tyler Stallings—he’s limited to what he received from the artist call. If not enough insightful artists pitch their work, you’re inevitably going to get a lot of art that just isn’t very interesting. I’m going to suggest you skip political art this time around. That doesn’t come easily, as it’s something I love with all of my heart. Instead, go do something of value. If you’re completely unaware of what’s going on and need inspiration, it’s better for you to read a newspaper or two than visit an art gallery. “Art As Protest” at Orange County Center for Contemporary Art, 117 N. Sycamore St., Santa Ana, (714) 667-1517; www.occca.org. Open Thurs.-Sun., noon-5 p.m. Through July 8. Free.